The Hotel Le Petit Palais is a 3 Star Hotel in on the French Riviera. Ideal for exploring French Riviera. Welcome to the Hotel Le Petit Palaisin Nice. Located in Nice, Hotel Le Petit Palais welcomes you in a green and elegant historic district. It is surrounded by majestic buildings. Le Petit Palais features air-conditioned rooms with a refined decor. Each is fitted with modern equipment. For more information on the Hotel Le Petit Palais French Riviera please click on the availability link above and below. Situe a Nice, Le Petit Palais vous accueille dans un elegant quartier ancien, veritable ecrin de verdure. Il a ete autrefois la demeure de Sacha Guitry. Le Petit Palais vous propose des chambres climatisees a la decoration raffinee. 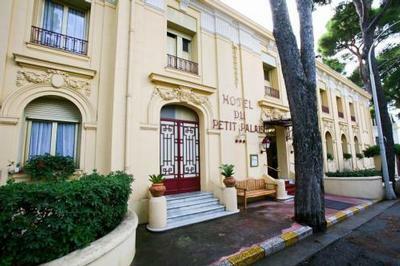 The Hotel Le Petit Palais, 3 Star Hotel is in Nice, Alpes-Maritimes, Provence Alpes Cote-dAzur, France. The address is 17, Av. Emile Bieckert, Nice, 6000.